Toyoda Gosei Co. has developed a type of plastic from which it has made car hoods and fenders that it says are as strong as those produced from sheet steel but 40% lighter. The company has no intention of entering the auto body business. Rather, the Toyota group company plans to collect data on the material's performance characteristics in hopes of encouraging carmakers to adopt it when they begin shifting from sheet metal to plastics for mass-produced models. That shift, according to Toyoda Gosei, is expected to begin in another three years. The new material is based on a reformulation of a general-purpose polyolefin resin molded into a honeycomb-like internal structure, giving the parts the strength of sheet steel, according to the firm. To evaluate the new material, Toyoda Gosei will begin driving tests this month using an electric version of Toyota Motor's Yaris, which is sold as the Vitz in Japan. The car's hood and fenders have been replaced with parts made from the plastic. 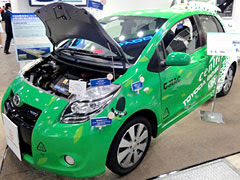 The vehicle will be driven for six months at the Central Japan International Airport in Aichi Prefecture to collect data on strength, durability and environmental performance over the course of several thousand kilometers. The biggest hurdle now is cost, since parts made from the plastic cost 30-40% more to produce than those made form sheet steel. However, Toyoda Gosei plans to lower the costs by increasing the efficiency of the manufacturing process.